Stetron is pleased to announce the development of a midsize speaker ideal for use in medical applications requiring IEC 60601-1-8 certification. 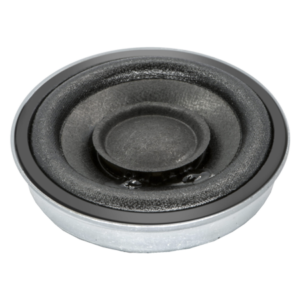 The key features of this speaker are Low THD, High Output SPL, Low Fo and a Low Profile design. The speaker measures 36mm and offers a height of 9.5mm without the gasket. Stetron is a premier supplier of custom audio solutions to fortune 500 companies worldwide. Established in 1965, Stetron has a demonstrated expertise in optimizing engineered components including microphones (ECMs), dynamic receivers and loudspeakers. Stetron’s Asian based manufacturing coupled with North American engineering, delivers technically advanced products at competitive prices. Stetron strives to provide the highest level of customer and technical support in the industry. We work with our partners to fully understand their audio requirements and help them design solutions that meet their requirements. Stetron maintains a full anechoic chamber and uses sophisticated software to measure a number of parameters including: THD, Life and load testing, Thiele-Small Parameters, Impedance and reliability. Stetron delivers strong technical experience and data you can trust. Stetron maintains a global presence with offices in Toronto, Canada; New York, United States; Taipei, Taiwan; Ningbo and Foshan, China.